Resting in the foothills of Uvita, just 1.5 miles from the beaches of Bahia Ballena, Playa Hermosa, and Playa Dominical. 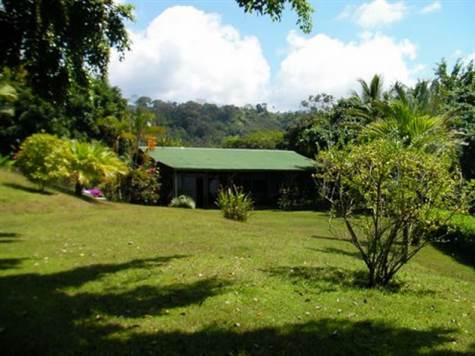 Los Arboles is a 19 acre eco residence that brings to life the elegance and spirit of Costa Rica. With almost 2000 sq. feet of living space in the main house and an additional 3000 sq. feet in the guest house, workers quarters, and bodega. This self-contained family compound was built over 10 years ago and covered in tropical hardwoods and fruit trees. It is completely surrounded by lush tropical and irreplaceable botanical landscaping ideal for optimal privacy, the property features extensive outdoor verandas, gardens and a greenhouse nursery. Throughout the property, lighted walking pathways explore the natural beauty and depth of the ranch. Ask for an appointment now.